In this section, I press Jobst to talk about his online persona. People have mixed feelings about him. One side has it that he's an interesting person with an immense wealth of knowledge and experience. Another side is always wary of his crusty, irritable personality which they feel can be off-putting and hard to work with. What does he feel about all that? Well, find out. 11. There's the real Jobst Brandt, and then there's the online Jobst Brandt. The latter portion in your claim to fame seals your status as a no-questions-asked guru of bicycling, if you will. I was interested in knowing where all this began. Did someone invite you to compile these words of wisdom and archive them online or was it self-started? JB : I started writing them long ago to fill voids in mechanical understanding that I perceived. Becoming a guru was from the attacks that responded to my explanations of natural phenomena. The impression probably comes mainly from bikers who believe in their "common knowledge", that is mostly misdirected. They feel they need to defend that position and go on the attack. Just search how many so called engineers insist that my analysis and instructions on the bicycle wheel are all wrong. I'm used to that. It's the story of my engineering career. I hear similar stories from other engineers. For years, there was just one newsgroup before splitting up into tech, misc, rides, market, etc... Back before it grew out of its pants it was a pleasant place with only rare disagreements. Once the place became noted, the BS artists realized they had a rostrum from which to spread their religion. 12. You also have an almost cruel stance against irrational statements. You are popularly associated with this wise, very experienced man with meticulous attention to detail, but also moody and cranky and perhaps a little myopic to suggestions while sticking to old fashioned advice. Do you agree with some of these views? JB : I have little patience with people who write anonymously, mainly because their reason (incompetence) for doing so. Well they don't explain why it is "old-fashioned" advice. Much of that comes indirectly from my bicycling that is not racing. That Sierra ride that is on someone's web site is a classic for iconoclasts. They feel that I am not giving them their due when in fact I don't mention their style that they are trying to claim is the only way. Another earlier point is that I was a faster and stronger rider than most of the locals and that irritated newbies. I am old and slow now but still go on long rides. 13. Coming back to this idea of people having misdirected knowledge, what's your pick for one that you find having to straighten out often? This bridge was built without suspension cables that Roebling had not yet invented, so all elements were long steel pinned bars. Click on center picture second row and see some of the beautiful structures engineers have built. The last shot in that sequence is the Chain Bridge. I was not disappointed. 14. I'm curious - do you personally know any of these online folks you exchange all this information with? JB : A few who are pleasant, yes. That's where I found the German (Klaus Schmidt) who assisted me in proof reading the German translation of my book. He once wrote off and on to rec.bicycle, but when it got big and broad and rude, he bailed out. The same seems to have happened to Bruce Hildenbrand whom I mention in one tour report. 15. Which brings me to probably one of most important questions to wrap up. How well did you know Sheldon Brown and could you write a little about your relationship with him? JB : I got along fine with him and we talked at InterBike for a few years until he said he was coming out my way in the summer to visit his daughter Tova, who was attending UC Santa Cruz. I met him at his motel in Santa Cruz, 65 miles from my house, from which we took a great ride along the coast and up through big redwoods before he descended to Santa Cruz from Summit Road while I rode home. He took the FAQ title page picture of me standing over my bicycle on that ride and I took some good ones of him that I am sure his wife has suitably saved. 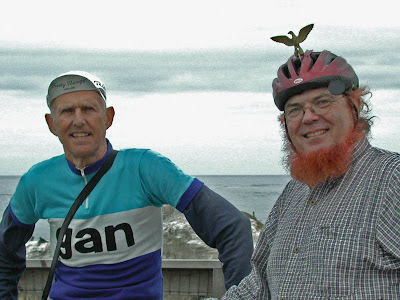 Jobst Brandt and Sheldon Brown in Santa Cruz in 2006. This photo was borrowed from the latter's journal, where he had documented the day's ride with Jobst. 16. He was a renaissance man. Do you feel the cycling world is a little emptier without his presence of mind? JB : I liked him a lot and found him to be no mechanical dummy. As you may recall, The London Times wrote a glowing obituary after his sudden death that came after the second time he came to Santa Cruz on which he and his wife had a lovely ride around the place. He was already suffering from deterioration but didn't let it take his bicycling away. The next time I saw him he was on an electric three-wheeler at InterBike, no longer able to walk. A great man! As you see, he believed in the stuff I wrote and put it on his web site. Here, I have dug up two relevant snippets. They contain Jobst's replies to newsgroups folks. In one, he clarifies the loads on the bicycle wheel that appeared difficult to grasp for one gentleman. In the other, he admonishes someone for posting anonymously. Be warned! Never post anonymously if you are writing to Jobst. And while you're at it, avoid smileys and other nonsensical characters too! Topic : Bicycle Wheel Loading (1999) : Eric Salathe initially wrote : "The Bicycle Wheel is beautifully written, but the persistent lack of acceptance of this idea among its readers, as well documented on this list, shows that the 'wheel stands on its lower spokes' slogan does not accomplish its function." JB's reply : "I chose not to condescend and state anything other than what is engineering fact, explaining why and how the wheel works. I know that many people have great difficulty visualizing this and I believe that is why the wire spoked wheel remained misunderstood and not analyzed until "the Bicycle Wheel" was published. Previously many authors wrote extensively about what they believed took place. None of these recognized that the top spokes or, for that matter, any other spokes of the wheel were affected by the vertical load except the bottom few in the tire contact zone. That loads only unload spokes was also not understood. When a wheel is overloaded or crashed to destruction, none of its spokes are overloaded (other than possibly being kinked after becoming slack). I am fairly sure that the whole subject is still a mystery to most people who should understand it. I overhear conversations and see postings here that reveal these misconceptions. Even people who seem to grasp the concept have said as much as "I crashed my wheel and have to get all new spokes". Progress is slow in coming." Topic : Anonymous Postings (2009) : "Dan O" initially justified to Jobst the unseen value in anonymous postings by writing : "What's in a name? You must assume that any information you make available on the internet will be harvested, stored, and used indefinitely and completely outside your control. This information can be accessible to any and every wacko 'in the world'. The availability of information can even affect the security of other people who might never have chosen to make it publicly available. So it is a sensible basic tenet to not provide unnecessary information to systems outside your own control." JB's reply : "I suppose you don't take off your dark glasses when introduced to people with whom you exchange thoughts and ideas. That and chewing gum is something one once learned not to do in polite societal encounters. I realize that this forum lost all that about 15 years ago and now we occasionally read about newsgroups that have vanished for the large volume of rude and anonymous postings. I hope you noticed that the least civil postings come from a raft of secret agents. Even Sheldon Brown had no effect on the genre in his days in spite of his courteous style of asking these writers to sign their work with real names. I guess this is like many other fads that people follow without cause or reason, like wearing dark glasses in all weather and night time too to have the I-spy look."